The New York Pizza Project is a new website and blog (later, a book) that explores the relationship between New York City and its quintessential pizza places. 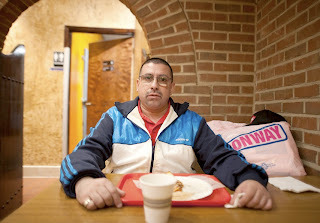 Created by "Corey, Gabe, Ian, Nick, and Tim...5 dudes born and raised in New York City," the New York Pizza Project includes interviews and photos of pizza places across the 5 boroughs of the city. Q: Why pizza as the quintessential NYC food? Why not hot dogs or knishes or something else? A: New York had a much richer street food culture around the turn of the century. 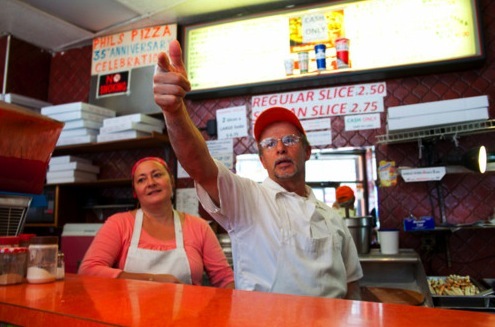 These peddlers pushed immigrant food like knishes, halal, oysters, sausages, and even pizza. Legal changes would eventually force most of these vendors off the street. After World War II, GI’s that were stationed in Italy came home demanding pizza. While I couldn’t really imagine some of these older street foods reincarnating as permanent shops, pizza made perfect sense, since it required a large oven. There was pizza in New York before the war, but it is from the 50’s on that we see a huge growth in pizza consumption in the city. Today, pizza fits New York’s pace. It is easy to grab on the go. It’s widely available. It’s affordable. There are vegetarian options. Most importantly, it’s delicious, and New Yorkers love delicious. Go to a pizza place in Florida and it may very well be called New York Pizza Co. or something like that. There is something about the New York pizza parlor that everyone wants to imitate. We run into tourists from all over the world during our journeys. For many, eating a slice is more important than seeing the Statue of Liberty. When we ask New Yorkers what is so special about our parlors, they tell us it’s not the austere setting or crispy crust, but the relationship with the staff. Q: What does a pizza joint need to qualify for inclusion in your project? A: Our intent is to capture all the type of places that we grew up grabbing a slice. The loose criteria we ended up creating were the following: has been in the neighborhood awhile, is beloved by the neighborhood, sells slices (as opposed to whole pies), and fits an aesthetic that we would call “classic New York pizzeria.” What that really means is "no frills." Q: What are your favorite pizza joints in each borough? Manhattan: Joe’s in Greenwich Village or Pizza Suprema on 8th Avenue near Penn Station. Brooklyn: Carmines on Norman Ave in Greenpoint, My Little Pizzeria on Court Street near Atlantic Avenue, and Nino’s in Bay Ridge for their Grandmama slice. Queens: VI Pizza in Bayside for maybe the best Sicilian in the city, and Amore in Flushing for a great slice and great owner, Andy. Q: What will the city lose when all these mom-and-pop pizza joints finally vanish--or do you think they never will? A: I’m not smart enough to predict what retail will look like in the future, but the pressures these shops are facing are real. Owners tell us all the time that while business is steady and recession-proof, pizza is not the business it used to be. The margins have narrowed significantly amidst rising rents, food costs, and city regulations. There is a real sense of pride in the pizza business, and great appreciation for the customers. So a lot of these places continue to work hard and put out the same product even it means that they take home a little less loot. Plus, they are becoming stuck in the middle of a new NY-pizza-verse of extremes, with 99 cent shops at one end and fancy Neapolitan places on the other. In a way, the places we’re going for in the project are special precisely because they are so ordinary. No price gimmicks, no 900-degree ovens, just a solid slice and a Coke for a few bucks. Lots of people we talk to have been going to the same pizza places for years or decades. For those people, these places offer up a feeling of consistency and a sense of home. We met a guy who grew up in Washington Heights and moved to England as a young man. 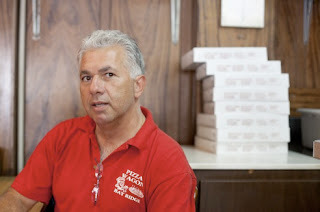 Every single time he came home, the whole family went straight to George’s Pizza from the airport, a tradition that’s been going on for over 10 years. Part of what we’re after is figuring out just how so many of these places have withstood the test of time in a city where tastes and trends are constantly shifting, especially in food. There really is no clear answer. The owners work hard, they put out good product, and they have loyal customers. If these places were to go, the city would lose part of what makes it special, part of its DNA. I don't get why he says the street food culture has died out. There are still tons of carts and trucks, halal, Mexican, all kinds of South American, etc. I don't see NY pizza's customer base shrinking, and I don't see a $2.50 slice place competing with a Neapolitan brick oven place. Two different products. Rising rent must be the big concern though. This is great. Everyone talks about the coal-oven stalwarts and high-end upstarts, so it's good to see classic neighborhood slice joints getting some recognition for change. Soon the guys from Five Guys Burger or Five Napkin Burger will start a Five Guys Pizza. Ken, you beat me to it! just took that pic this weekend. very cool. They should check out Luigi's in Sunset Park! Love their white pizza. TyN, we've actually been to Luigi's. It's freakin' great! Great pics. Thanks for posting those. I like the fact that the emphasis is on the people and the places and not so much the pizza. Anxious to watch this project develop! I second Luigi's, on Fifth at 21st. Excellent pizza, and Giovanni is a great guy. Nothing tarted up about the place, & often some good 70s movies on the TV. Always feel happy after I've been there. corner lex/e.101st. w.side of lex, e.harlem. Claribel, Amore is a hidden treasure to people outside Flushing. As a patron told us when we visited: "You have to be doing something right to stay afloat in a strip mall like this." Luigi's is the real deal.